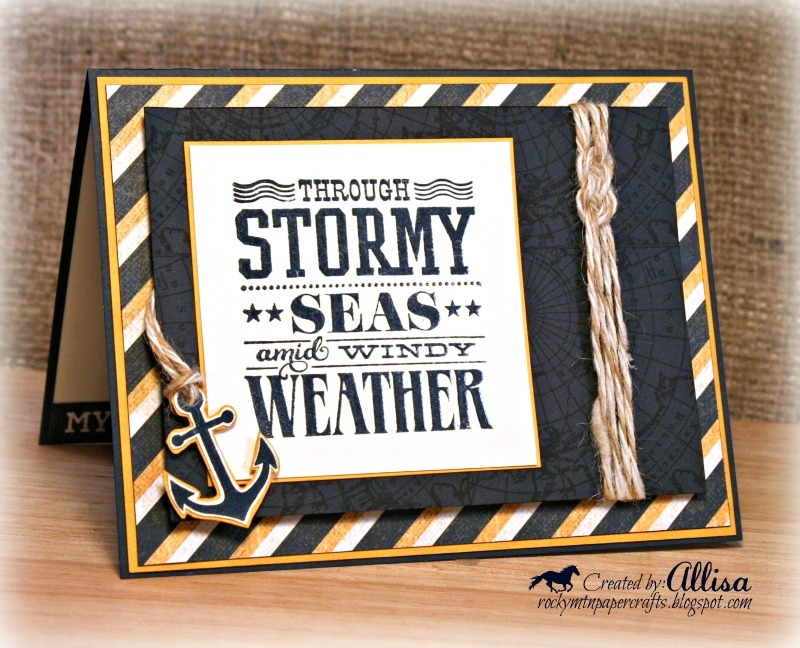 Rocky Mountain Paper Crafts: Sailing with Tommy! Slowly but surely, my scrapbook room is coming back together. Since my desk was finally clear, I decided to create a card for the new Curtain Call Challenge. Their new challenge is the talk of blogland and there is so much talent featured! If you are not inclined to enter the challenge, stop by and check out the awesome featured cards by the design team! 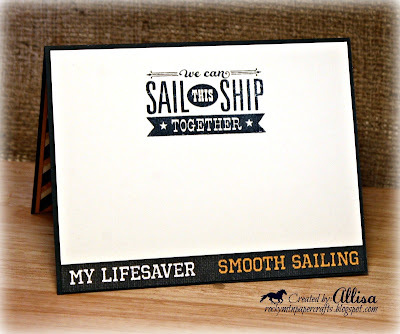 The theme this week is Nautical and my Tommy papers and stamps were the perfect combination! My card is based on the sketch challenge at Mojo Monday. I flipped the sketch on it's side to work with my nautical saying. In keeping with the nautical theme, I did my best to make realistic embellishments. I tied my Baker's Twine in a sailor knot. The sailor knot is much more manly than a bow for a masculine card. It did take me longer to tie the knot than to make the whole card though! (Where is a boy scout when you need one?) I first started out with YouTube video, of I am sure a real sailor, that lasted about 30 seconds....not working for me! I decided I needed the crafter aspect for this to work for me! Special thanks to Barbara Anders for the step by step tutorial which I found on her blog. The pictures made it easy peasy. 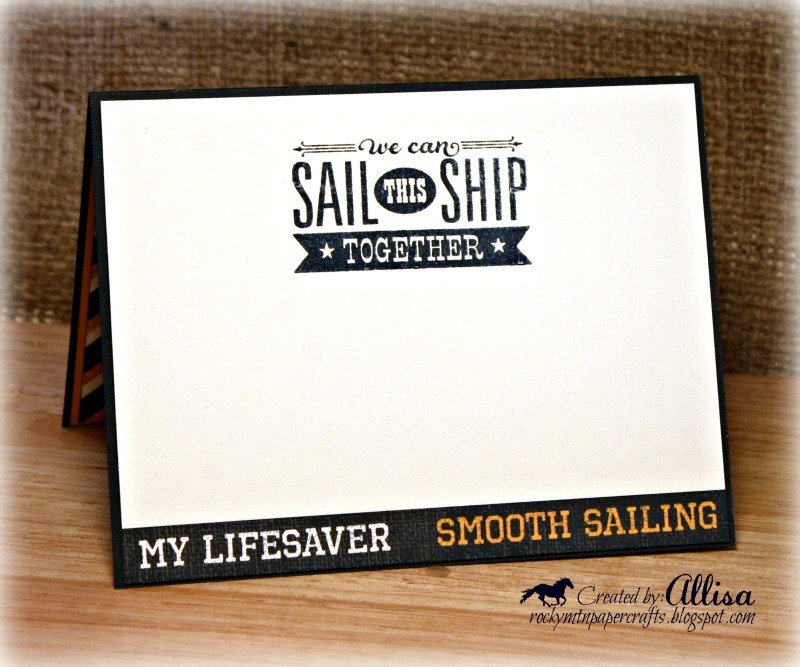 My card was created with stamps from the Tommy Workshop On the Go Kit. The kit is only available While Supplies Last as it will soon be retired. I selectively inked the large sentiment stamp, putting part of the sentiment on the front of my card and the remaining on the inside. I also created my own background paper by stamping Outdoor Denim ink onto Outdoor Denim cardstock. I love the subtle tone on tone look. Fabulous card! LOVE the knot, sentiment, colors, and design... (in other words...everything!) :) Thanks for joining us for the Simon Says Stamp Wednesday Challenge! 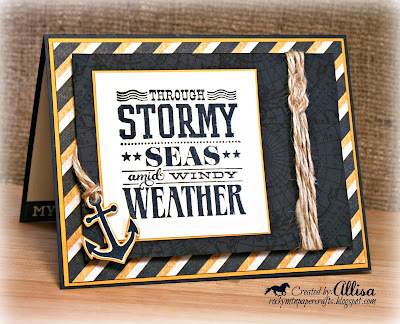 What a wonderful take on the nautical challenge, Allisa! 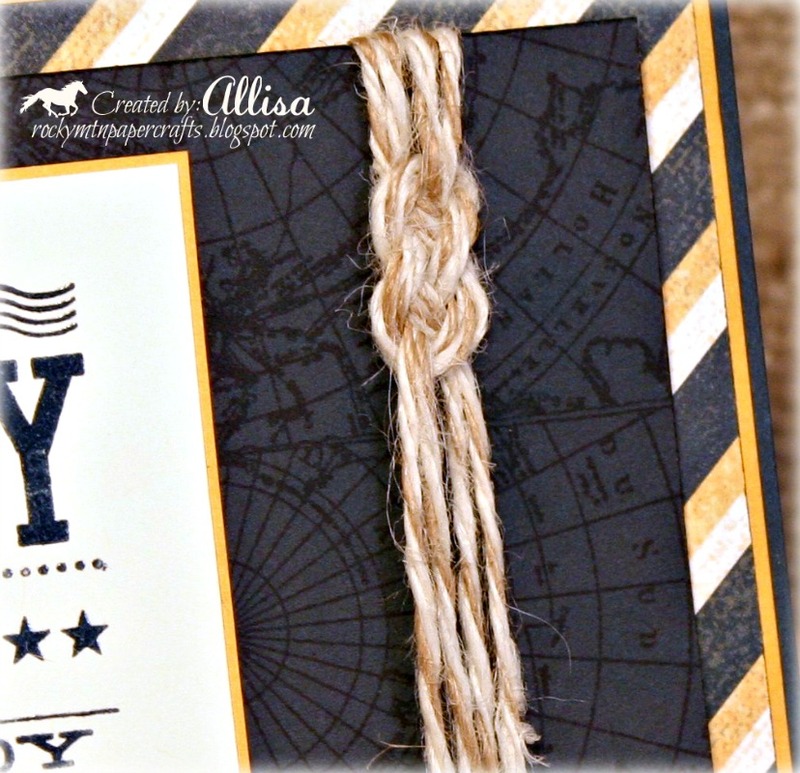 Your bold sentiment panel, pattern and color choices are fantastic and I must learn how to tie a sailor knot, too! Thanks so much for joining in on the fun at the Curtain Call! This card just ROCKS!!! Thanks for playing along with us over at the Curtain Call!! Love the map BG image and the wonderful sailor's knot. Thanks for joining us at the Curtain Call. Oh Allisa - this is just perfect in every way! The bold stripes, the knot (I wouldn't even have tried), the map on the blue, and the sentiments are the best! Thank you for joining us at the first Curtain Call! Allisa, I am in LOVE with this card! The Colors, The Textures, the layers, everything is just perfect!! Thank you so much for playing along with us at the Curtain Call Inspiration Challenge! Allisa I love your card, the colours, the papers, the fabulous twine knot--beautiful. 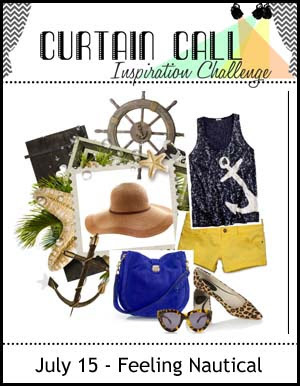 Thank you so much for sharing with us for the first Curtain Call Inspiration Challenge. Last Chance for Retiring Items, July Specials! Merry Monday July Challenge-Last Week!